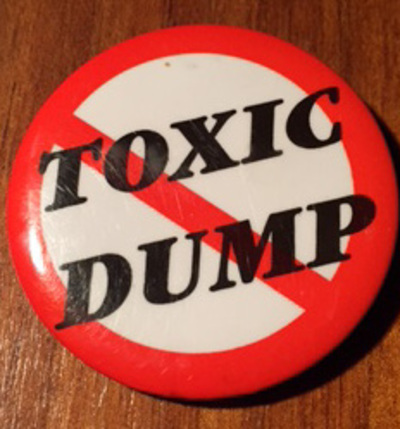 It was with surprise that I happened across my No Toxic Dump badge in my bedside table drawer. Surprise because I’d forgotten that I’d participated in what had been one of the most powerful democratic moments of my life. It had been a few years ago and the government at the time, clearly without knowing the impact their actions would have and how it would contribute to their demise a short time later, decided to set up a toxic dump in the western suburbs of Melbourne. Not in our backyard, the western suburbians said. Not in any backyard for that matter. It was the days before social media, so old style public campaigning took place. Public meetings, a rally in the main streets of Melbourne Central Business District, lots of letter boxing and newspaper articles and letters to editors. I recall marching with my children in the rally, proudly asserting our right to have a voice, angry with the feelings of being treated badly as a group of residents and feeling the sense of power that comes from speaking out loudly as a group. The dump did not proceed, the government lost power not long after and the fight became the talk of the west for quite a while, even resulting in a play being written and performed years later. It’s not that often that people who feel ignored and marginalized win such a significant battle after all. This is of course what we’ve been seeing a lot of in recent weeks. Democracy at work. In Europe we’ve witnessed from afar marches and rallies as well as extraordinary social media activity in relation to the Je Suis Charlie campaign. At home we’ve seen a less public, yet very strong, campaign to reverse the government’s decision around proposed changes to Medicare. An online petition in just a few short days was able to obtain over 44,000 signatures. This created sufficient fuss to lead the minister to talk about needing to listen and consult more when considering changes that affected the day to day lives of constituents. Democracy at its best at work you could say.